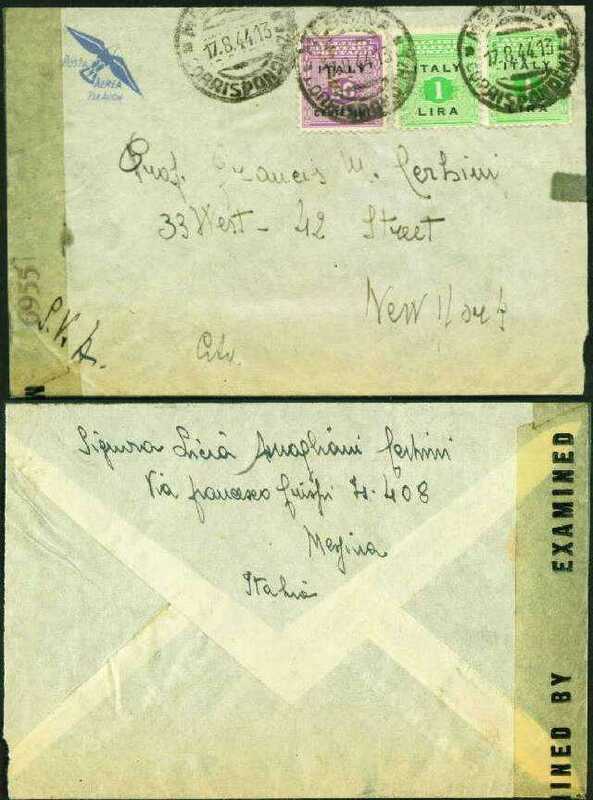 This censored airmail letter was sent from Messina. Messina is on the very northeast corner of Sicily at the toe of the Italian boot. General Montgomery on their triumphal entries into the city in World War II. The addressee was a Professor in New York City. Airmail was requested by using preprinted airmail envelopes. overprinted with Italy and Centesimi or Lira. nations were liberated at the end of World War II. The AMG stamps for Italy were issued in 1943.
two 1 l light yellow green (Scott Italy 1N4 and 1N6). There are three MESSINA | CORRISPONDENZ CDS. The cover was censored and closed with numbered tape. I believe the initials S. [or P.] V. A. were the initials of the censor.